Ōsaka Namba Station (大阪難波駅, Ōsaka-Nanba-eki) is a railway station on the Kintetsu Namba Line and the Hanshin Railway Hanshin Namba Line in the Namba district of Chūō-ku, Osaka, Japan. 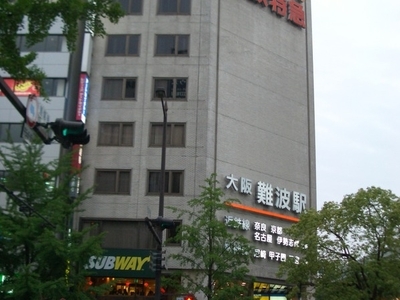 It is adjacent to Namba Station and JR Namba Station. Trains of the Nara Line depart from and arrive at the station. The station was first named Kintetsu Namba Station (近鉄難波駅, Kintetsu-Nanba-eki) on March 15, 1970, when Kintetsu's Namba Line opened. It was renamed to the present name on March 20, 2009, the date of opening of the Hanshin Namba Line. There are an island platform and a side platform with three tracks on the third basement, parallel to Namba Station on the Osaka Municipal Subway Sennichimae Line. There is a returning track in the west of the platforms between the 2 tracks of the Hanshin Namba Line. Here's the our members favorite photos of "Railway Stations near Namba". Upload your photo of Ōsaka Namba Station!